More than 130 people were killed in an attack on a village in central Mali on Saturday by armed men wearing traditional Dogon hunters’ clothing. The attack took place while UN ambassadors were in Mali to discuss increased violence. The Security Council mission met Prime Minister Soumeylou Boubeye Maiga to talk about the increased threat from jihadist fighters in central Mali. The victims of Saturday’s deadly attack were “killed with guns and machetes”, a local security official told AFP news agency. Witnesses also told AFP that nearly all the huts in the village had been burned down. The mayor of the neighbouring village of Ouenkoro, Cheick Harouna Sankare, described the attack as a “massacre”. The Dogon also accuse Fulanis of ties to jihadist groups. 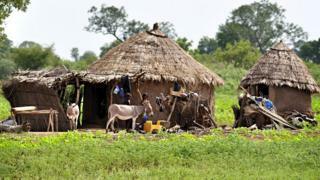 The Fulanis claim that Mali’s military has armed the hunters to attack them. The militants said it was in response to violence against Fulani herdsmen. One Ogossagou resident, who asked not to be identified, told Reuters news agency that Saturday’s violence appeared to be in retaliation for the attack on the soldiers.